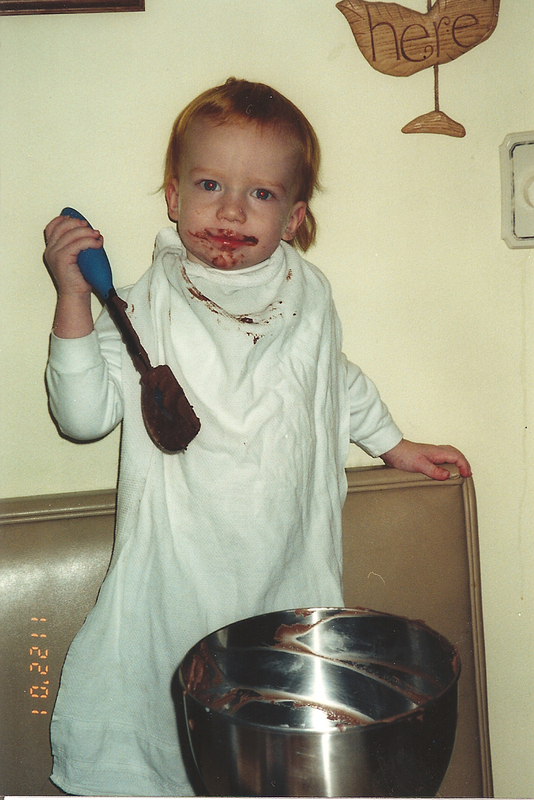 When I was a little girl, I got the fun job of making cookies. My favorite was chocolate chip. I won a blue ribbon in 4-H for my chocolate chip cookies, the secret ingredient was Crisco. Mixing up the cookies was easy, it was all the baking that got tedious. Deanna loved to bake cookies called Cherry Winks. Yuck. I hated those cookies. For one thing they had corn flakes in them, and the only good thing about that was it brought us closer to the 3 Post Toasties box-tops for another cereal bowl and juice glass; hey had those sweetie-sweet cherries in a jar in there, too. That made my jaws just start to pucker up on the inside and my stomach said, ‘don’t send that down here, please don’t send those cherries down here.’ Dad said that me and Mom were the only people he knew who had insides that talked, and the only people who could tell just where our food was in our body at any time, like how I couldn’t drink milk with Mom’s vegetable soup, ’cause the milk just floated on top the grease from the soup inside my stomach. Bonita liked to make peanut butter cookies. I think she liked smashing the balls down with a fork, making a neat criss-cross on top. The smell of those cookies sank down into me like a warm hug from the inside out. Peanut butter cookies are best with milk and Nestles Quik. N-E-S-T-L-E-S, Nestles’ makes the very best…Cho…’clate. I loved tha t dog Farfel with his big flapping mouth, and I loved chocolate milk: two heaping teaspoons in a glass of cold whole milk; it tasted almost as good as a milkshake. We weren’t allowed to dunk cookies in milk, that’s disgusting.I liked to dunk the teaspoon into the milk with the Nestles Quik still on it, bring it out and watch the wet bubble pop, letting loose dry powder underneath. Bonita liked to put some of the powder in her mouth, put her scissored fingers to her lips squeezed together like a kiss and blow chocolate smoke. Chocolate Chip cookies were best with white milk. Here’s how I made them. First get all the stuff out, otherwise, a Little Kid might come around and want a pony-back ride, or need to go potty and the next thing I’d know, flat cookies, and now I had a mystery to solve, and wasted ingredients. That’s bad. Crisco, brown sugar, white sugar, flour baking soda, salt, eggs, flour, chocolate chips and nuts. Nuts don’t have to go in, but if you want a blue ribbon, lots of chocolate chips and lots of nuts. Judges love those. Then put in four large eggs or 5 small eggs and 2 teaspoons of vanilla. If you have a new pullet chicken you might even need six eggs. Whoops, I forgot to tell you to get the vanilla out. That’s what happens with interruptions. If you forget the vanilla, that’s okay, the cookies will taste just as good to kids, but no blue ribbon from the judges; adults can spot missing vanilla a mile a way; for some reason, judges are always adults. Mix everything up again, just like before. Now comes the hard part. Mom always told me to sift it all together so the baking soda and salt got mixed in, but it works just the same if I just put it in somewhere in the middle. Mix everything round and round until it’s all smooth. This part is hard, but you gotta do it that way, otherwise, the first cookies are too round and the last cookies are flat, and there’s a bunch of flour sitting on the bottom of the bowl that’s a big surprise, then if you’re like me, you’re a little bit mad at yourself for not being as careful as you know you should’ve been, and a little bit in a hurry, so Mom doesn’t find out. Now mix in a big bag of Nestles chocolate chips and two cups of chopped up nuts. I always ate a few before they go in, just because I like them so much, but don’t give too many to the Little Kids, or the cookies won’t be award-winning. Here’s the part that gets boring: scoop out the dough on the cookie sheet, twelve little mounds. Sometimes I like to take a fingerful and eat it raw, but then I had to look out for Mom, she hates that, sometimes she slapped my fingers and told me to cut it out. This recipe makes a whole lot of cookies, it seemed like it took all day, but it really didn’t, ’cause usually Bonita and Deanna made their cookies on the same day. Bake for exactly 12 minutes at 350 degrees. You’re supposed to heat up the oven first, but it’s okay if you didn’t. The first batch will take a little longer. I never heat the oven up first, especially in the summertime, then the house just got heated up faster. When the cookies came out, let them cool just for a couple of minutes, then slide them out onto newspaper spread all over the dining room table. Lots of people didn’t know how useful newspaper was, I learned about it in school and from Mom: It’s good for cookies, like I just said, and it’s good for washing window, ’cause no lint like old diapers, and it could kill germs, so if you ever had a baby at home, it should be wrapped it in newspaper, then get to the hospital and hope the nurses learned the same thing in school, otherwise they would probably think you were a little weird showing up with a newborn baby peaking out from the headlines of yesterday’s newspaper. I can just smell the cookies, coming out of the oven now. I love all kinds of foods and just like the experts recommend I eat all the colors: red apples, green beans, tomatoes, celery, purple eggplant; but my favorite color for food is brown, because that’s the color of chocolate chip cookies. That’s why I’m always dieting, trying to take little portions and that’s why I’m writing this at 6:15 in the morning. That’s right, it’s diet time again, and I am hungry. Guess I’ll go get some yogurt and a banana.